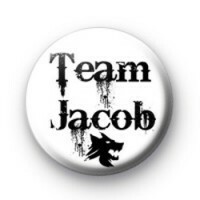 This black and white Team Jacob Badge is a nod to the cult Twilight novels which became popular a few years ago. Vampires and werewolves were pitted against each other in the Twilight books and then the films. Fans picked sides and were either Team Jacob or Team Edward, which are you? How many times have you read the Twilight Saga novels?